home as a platform to launch The Center for Early Childhood Creativity and Innovation, which will be dedicated to inspiring future generations of dreamers and doers. 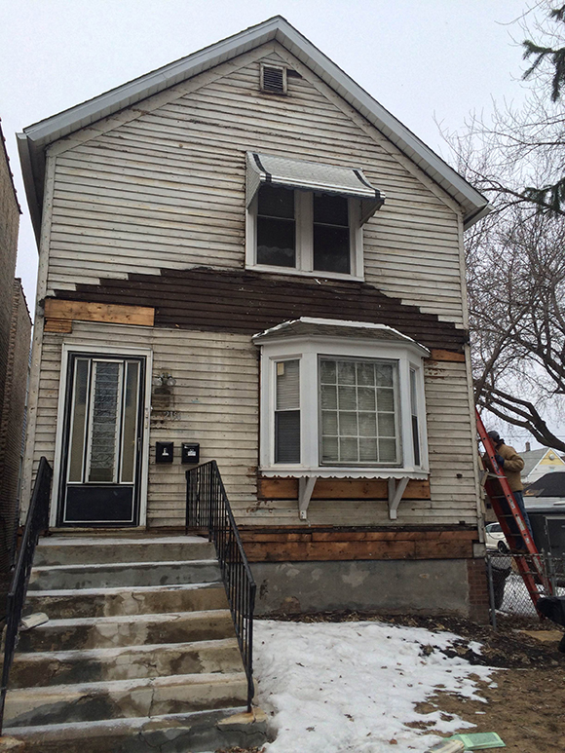 The restoration has begun, with the removal of the contemporary aluminum siding. Among the many exciting details that have already been revealed is a former window long hidden, and some of the original nails hammered in by Elias himself. We are on the way, but we have a long road ahead. 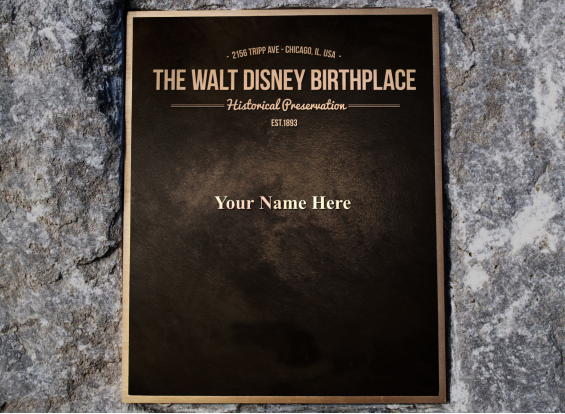 This campaign ends on December 5th, Walt's 113th birthday. As a gift to his memory, let's make this dream come true! As you might imagine, recreating Victorian-era glass panels, wooden window frames, and related fixtures is more expensive that simply purchasing modern off-the-shelf hardware. Each window will cost an average of $2,000 to restore properly. We must complete this phase to protect the home from the brutal Chicago winter weather. And it will set the stage for Phase Two, which we plan to begin next Spring. Phase Three and beyond will complete the restoration of the interior, the development of The Center For Early Childhood Creativity and Innovation, and more! Here are the rewards we are offering for our supporters! $10 – The Digital Art Pack! 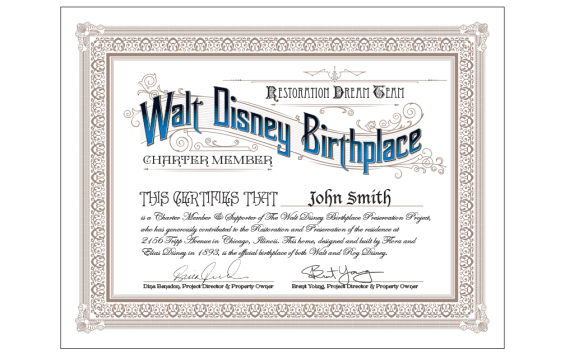 This includes a digital version of The Walt Disney Birthplace concept art by artist Clara Moon (seen at the top of the page), and a digital version of the "Restoration Dream Team Charter Member Certificate!" $55 – This beautiful original art piece, reproduced as a limited-edition giclée, was created for the project by renowned artist Karen Armitage! (www.armitageimages.com). Frame Not Included. Total giclée size: 13" x 19"
$125 – Become a permanent part of the home with your own dedicated paver stone, engraved with your name (three lines of text total)* placed on the walkway in front of and alongside the house. x 3” x 1” acrylic block. you and up to 3 guests! $2,500 – "Window Sponsor!" Your name will be engraved on a brass plaque affixed to the interior of the window frame,* forever acknowledging your support PLUS the entire V.I.P. package ($1,000 level)! $10,000 – "Live The Magic!" Your name inscribed on a plaque in the home's entryway, PLUS the entire V.I.P. package ($1000 level) PLUS One Overnight Stay for you and a guest in the restored home! package PLUS One Overnight Stay for you and a guest in the restored home! *Please note that these are only artistic representations of the final rewards, and are subject to change. Reaching the $15,000 Tipping Point will allow us to restore the upstairs windows. To complete the other two steps – the siding restoration, and sealing and painting of the street-facing sides – we'll need to raise the remaining $25,000. trademarks is used purely for historical reference and informational purposes. 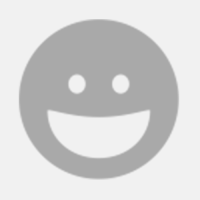 The Digital Art Pack! 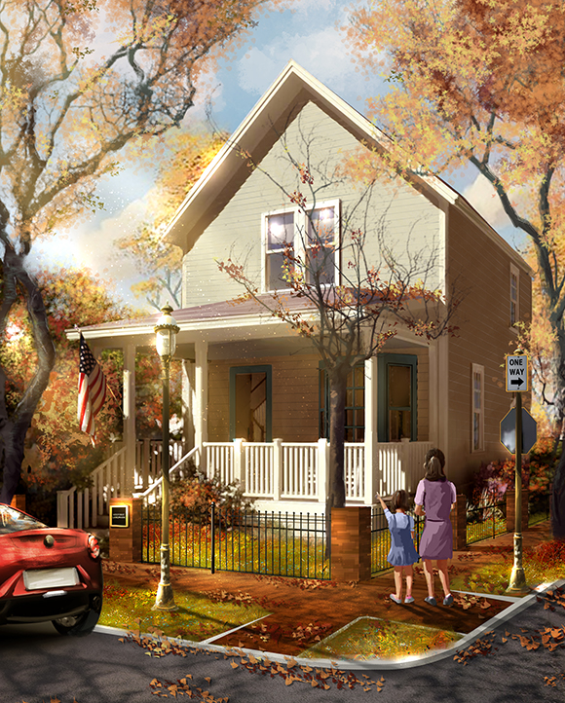 This includes a digital version of The Walt Disney Birthplace concept art by Clara Moon, and a digital version of the "Restoration Dream Team Charter Member Certificate!" 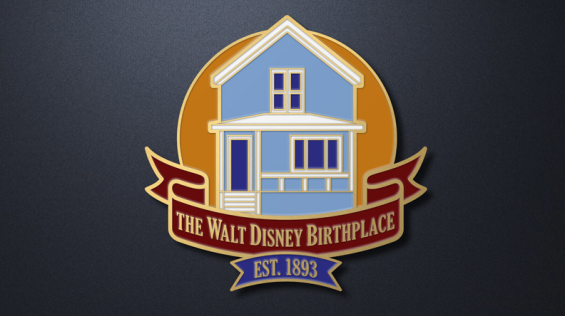 The collectible Walt Disney Birthplace pin! 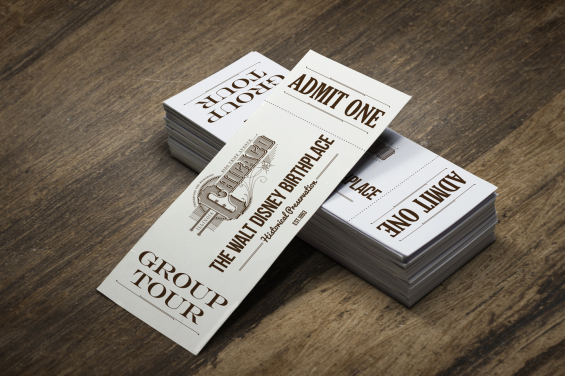 One ticket to join a scheduled group tour of the restored home! 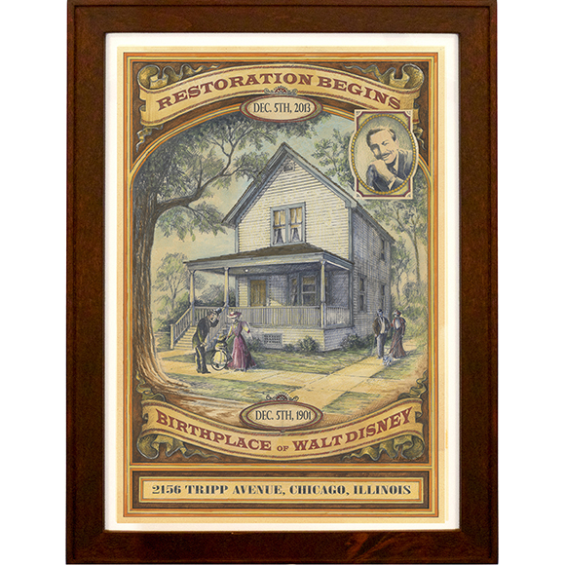 The Walt Disney Birthplace Restoration T-Shirt! 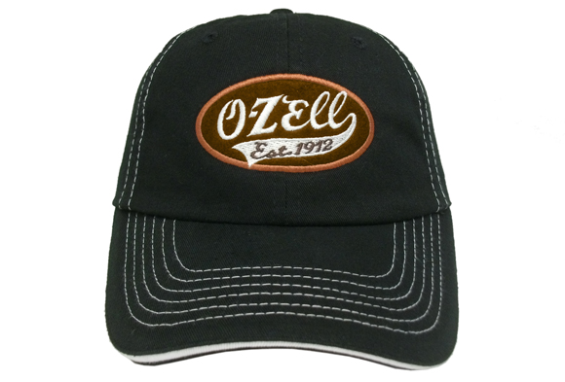 The O-Zell Soda Baseball Cap! 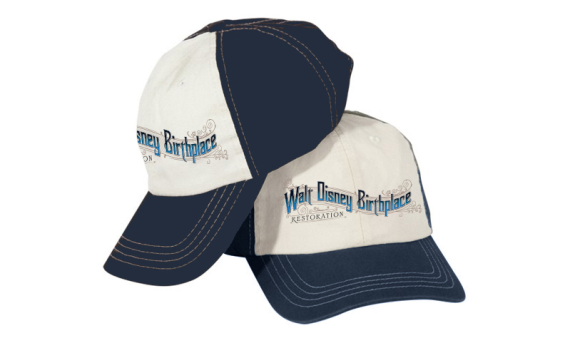 The Walt Disney Birthplace Baseball Cap! A dedicated paver stone engraved with your name (three lines of text total) placed on the walkway in front of the house, becoming a permanent part of the home! 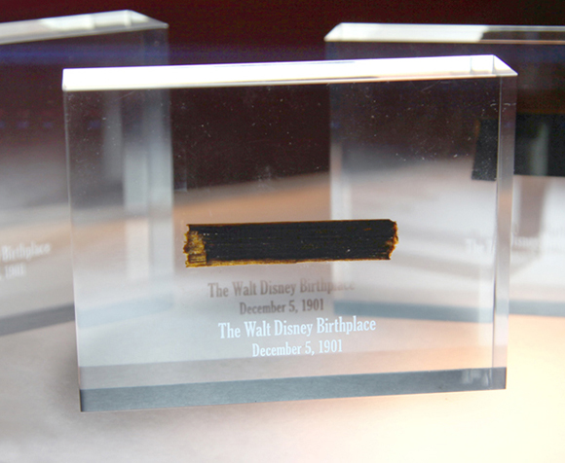 A very special limited-edition Walt Disney Birthplace Cedar Shake Wood Chip molded into a 4” x 3” x 1” acrylic block. Each of these one-of-a-kind chips will come directly from the original cedar shake roof material Elias used to build the house! V.I.P. Package! Includes the O-Zell hat, the two t-shirts, the collectible pin, a print of the Clara Moon concept art, the Karen Armitage print, the paver stone, the Cedar Shake Block AND one private tour of the restored home for you and up to 3 guests! "Window Sponsor!" Your name will be engraved on a brass plaque affixed to the interior of the window frame, forever acknowledging your support PLUS the entire V.I.P. package ($1000 level)! "Live The Magic!" Your name inscribed on a plaque in the home's entryway, PLUS the entire V.I.P. package ($1000 level) PLUS One Overnight Stay for you and a guest in the restored home! "Phase One Restoration Benefactor!" 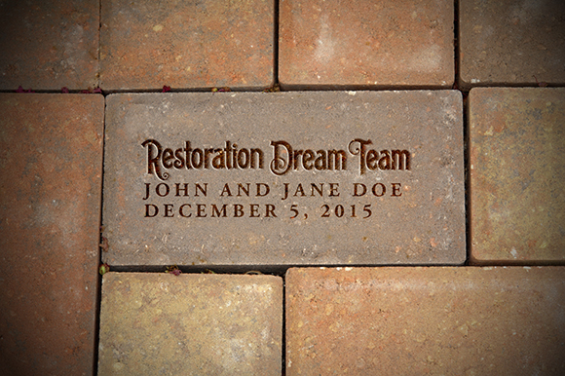 Your name will be engraved on the brass plaque in front of the home, indicating that you are a "Cornerstone Backer" of Phase One of the restoration. Also includes the entire V.I.P. ($1,000 level) package PLUS One Overnight Stay for you and a guest in the restored home!